There are 6 main styles which are described below. 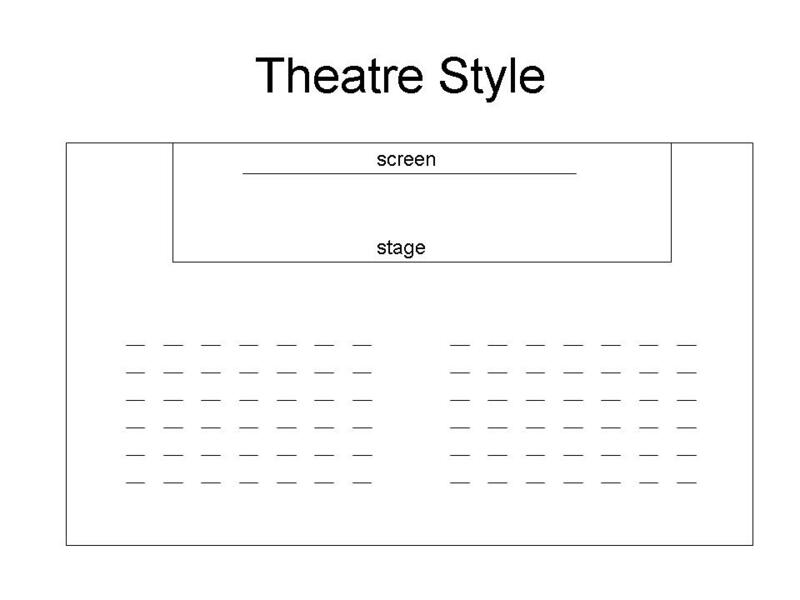 Theatre style seating allows the most people for a given size of room. This is fine for an audience who will be listening to presentations and do not need to make many notes or interact with each other. There is usually an aisle up the middle to facilitate the audience getting to their seats and also to help everyone gain a better view of the middle of the stage. By having an aisle in the middle it means the vast majority of people will be at a slight angle to the presenter so they can see him/her over the shoulders of the people in front, rather than having to look over the person in front’s head. 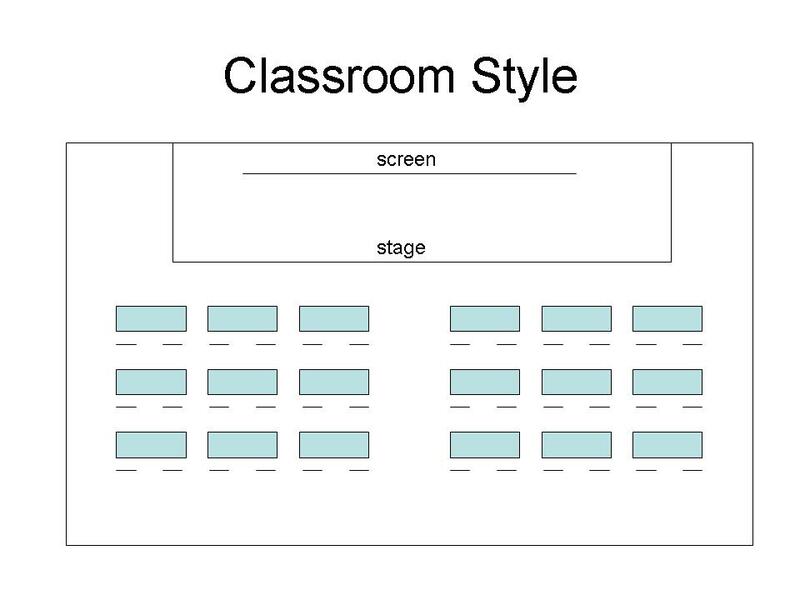 Classroom style requires about three times as much space per person as theatre style but provides everyone with some where to rest their papers and equipment. It also allows refreshments to be provided on the tables. 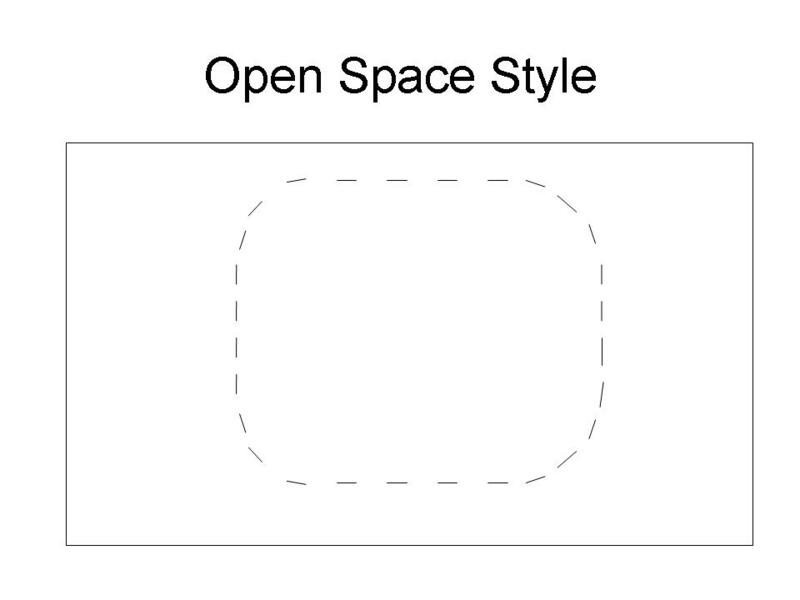 This style is good for audiences who may need to take notes or work individually during the presentation(s) but who do not need to interact with each other. In the unlikely scenario that your event ends up with far fewer bookings than originally expected changing the layout from theatre style to classroom style can make a poorly attended event seemed packed out and add an extra feeling of quality to the event. 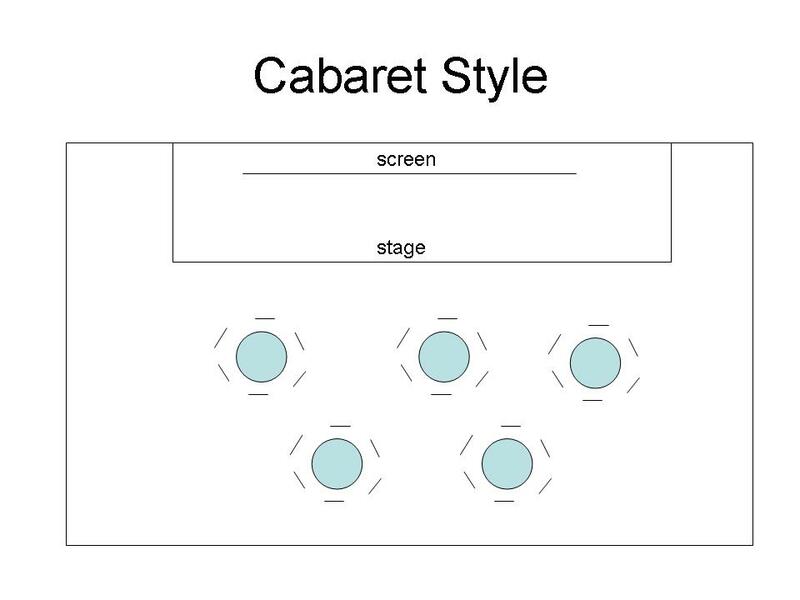 In Cabaret style, people are sitting in groups around tables. This is not so good when there will be a lot of presentations from the front of the room, but is good for workshops, where each of the groups will be working independently from each other and then presenting their results. When you want a mixture of presentations from the front and group based work, arrange the seats in a U around each table, so that no-one has their back to the presenter. 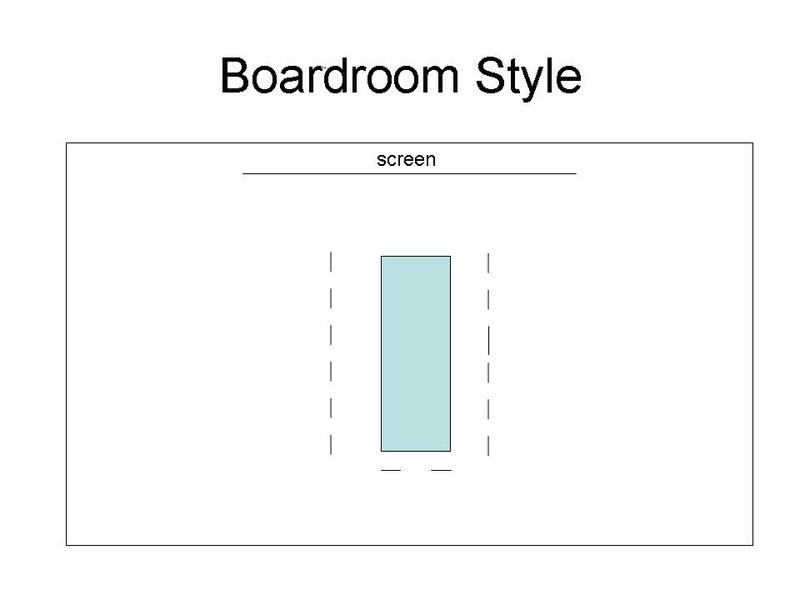 Boardroom style works well if the group is reasonably small and will spend most of the time talking to each other or listening to one or two speakers who are not using a screen. The Horseshoe is similar to the Boardroom Style except that it allows more people to participate. It is slightly better than an ordinary boardroom layout for giving presentations, which rely on being able to see the projector screen, because most people will have a better view of the screen. 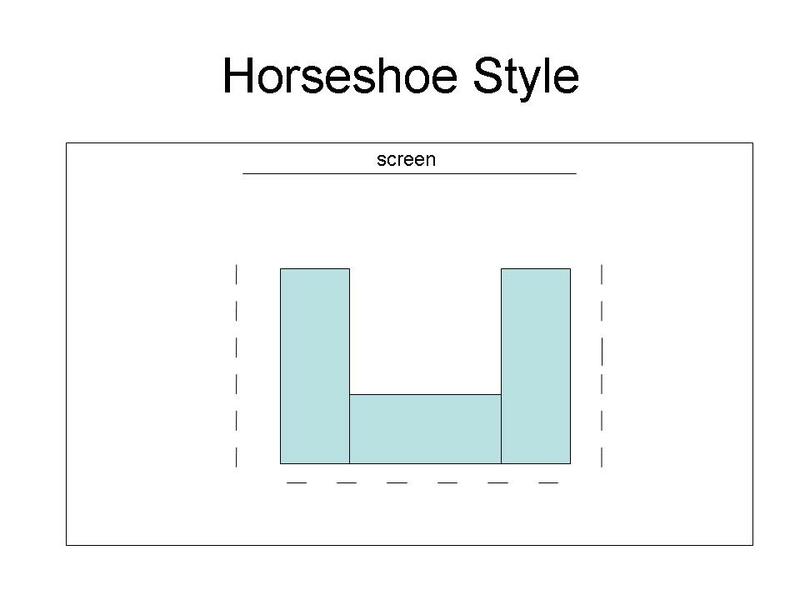 The horse-shoe layout is often preferred by trainers, as it gives a good mix for sitting and listening and interaction between the class members. Walking into the “hole” in the middle of the desks is a good way to command attention as a trainer. Finally, the Open Space layout is ideal for interactive meetings, where everyone is involved in a conversation or series of short presentations from the members, which do not require a screen and projector. There is nowhere for people to lean on while making notes but the fact that there are no barriers and everyone can see each other helps the collaborative and interactive nature of the event. Of course, the circle can be either a horseshoe shaped open circle or a fully closed circle. You can’t give long presentations at an Open Space meeting but you do need to have a strong facilitator at such a meeting otherwise the interactivity can quickly descend into chaos. Arrive early – So you have time to cure or think up a work around for any problems. Ensure the room is tidy – don’t allow the state of the room or anything else that is going on to distract your audience. Know how ALL the equipment works – don’t get caught out if the projector blows a bulb, your screensaver pops up, or the flipchart pens have run of ink. Presentations take place in all types and sizes of rooms. They may not even happen in a room at all. The space and the facilities the room provides can make a huge difference to the effectiveness of any presentation. I have 3 simple rules about the room you are using for your presentation. You should always arrive early so that you can become accustomed to the room itself and check it over before your audience arrive. Arriving just before you are about to present, means there is no time to fix any problems that you may find and no time to grow accustomed to your surroundings. When you are one of a series of presenters, it is often best to practise your entrance. How will you get up to your speaking position? What does it feel like standing there? Where will I put my notes? A word of warning if you are using cue cards or notes, do not leave them on a lectern, keep them with you. It is all too easy for the previous speaker or the MC to pick up your notes along with theirs, leaving you helpless. Make a note of where people come in. Will late comers be able to join without interrupting your flow? You should minimise the number and level of distractions, so that the audience pays attention to you. All too often presentations are made in an internal office room where various debris has been left behind by the previous occupant, including: writing on the white board or flipchart, books and papers left on desks or window sills, pieces of computer equipment that are not currently in use. All these things work as distractions from your presentation and should be tidied up before your audience arrive. Close the blinds on any windows in the room so that you audience are not distracted by what is going on outside. Make sure everyone can see you and the screen or flipchart (assuming you are using one). Try sitting in the back row to check that you can read the content of your slides. While you are there look around the room and make a note of anything that you can see that you do not need for the presentation and then remove those items. 3. Make sure that you know how to operate all the equipment. Do not forget to turn off your mobile phone and the screensaver on your laptop. During rehearsals you will never spend more than 5 minutes on any one slide but in an actial presentation it is not unusual for some one to ask a question and you can be on the same slide for 15 minutes or so, which is when your screen saver will pop up. No matter how politically correct your screen saver is, it is very unlikely that it was intended to form part of the presentation. These days many other background tasks running on a PC can also interrupt your presentation such as “You have mail” messages, Instant Messaging text, anti-virus scans etc. try to turn all these things off before the presentation. Make sure the pens all work, if you are going to use a flipchart or whiteboard. To make sure people can hear you, ask a friend or colleague to sit in the back row during the presentation, they can then signal to you if your voice is too quiet. When you are using a microphone, make sure you know how to turn it on, and do not forget to turn it off when you leave the stage. You do not want your private conversations being broadcast to the whole room. While I’m on the subject of microphones, don’t be tempted to tap it or shout “testing, one, two, three” to see if it working, it will make you look very unprofessional. With modern projection equipment, you should not need to turn the lights down for people to see the screen; however, it is always wise to check that there are no awkward reflections, which might interfere with people’s vision. When using PowerPoint, a little known trick is to set the presentation up and then press ‘B’. This turns the screen black so that your first slide is not displayed until you are ready to begin. Pressing ‘B’ again turns on the presentation. Similarly, ‘W’ will turn the screen white. Sod’s Law states that if you rely on any machinery it will go wrong when you are most need it to work. Bearing this in mind it is often useful to have a back-up plan in mind in case your equipment fails. Probably the best piece of advice I have ever been given is not to rely on your slides to remind you what you will be talking about. That way if the slides can not be displayed or the projector breaks part of the way through your presentation; you can still finish your presentation. A rhetorical question can be a good way of opening a presentation or a sub-section of a presentation. They have far more impact than a bland statement and will hopefully get your audience thinking. By posing a rhetorical question your audience have to start thinking about the answer. Leave a pause after you have asked the question to let it sink in, before starting to give the answer. is likely to grab people’s attention and make them listen to what you have to say. You are currently browsing the archives for the R category.